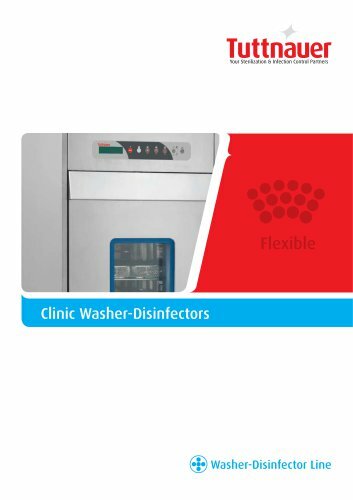 Clinic Washer-Disinfectors Long Lasting and Safe Water Quality Built-in large capacity water softener for a continuous supply of softened water enhances cleaning effectiveness and prevents build-up of limescale. Quality Components Washing chamber, washing arms and filters are made of high quality corrosion proof AISI 316 stainless steel. Double wall chamber construction and thorough insulation minimize heat loss and electricity consumption. Standard Compliant All Tuttnauer washer-disinfectors comply with 93/42/EEC and are manufactured in accordance with EN ISO 15883-1 and 2.